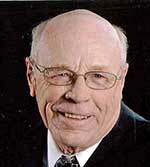 Kenneth D. Pollock, 81, of Denver, Iowa passed away on Saturday, December 29, 2018 at the Cedar Valley Hospice Home in Waterloo, Iowa. Kenneth Dale Pollock was born on April 6, 1937, the son of John Martin and Martha (Shelton) Gibbs in New Hartford, Iowa. He was adopted on August 30, 1949, by Cecil and Marie (Babbitt) Pollock. Kenny graduated from Denver High School in 1956. He was called from the Army Reserves to active duty on June 25, 1956 until his discharge on February 19, 1958. On September 14, 1958, he was united in marriage to Brenda Griese in Denver, Iowa. Kenny was employed at John Deere, retiring after 34 years. He also farmed for over 40 years in the Denver area. Kenny was a member of St. John Lutheran Church – Maxfield, Denver American Legion, Post 653 and the PTO Club. He enjoyed fishing, tractor pulling, Iowa Hawkeye sports and social hour with friends, but most especially spending time with his grandchildren and great-grandchildren. Survivors are his wife, Brenda Pollock of Denver, Iowa; two sons, Todd (Sheila) Pollock of Mt Vernon, Iowa, Trent (Tina) Pollock of Denver, Iowa, three daughters, Tammy (Randy) Bakken of Cedar Falls, Iowa, Tonja (Michael) Johnson of Parker, Colorado and Tia Manchester of Evansdale, Iowa; ten grandchildren, Kegan (Sarah) Bakken, Jarek (Jill) Bakken, Kyran Johnson, Riley Pollock, McKenna Pollock, Ireland Pollock, Sayre Pollock, Si'le Pollock, Indya Beaman, and Zadyn Manchester; three great-grandchildren, Jovie, Asher and Everly Bakken; two brothers, Richard and James Gibbs and a sister-in-law, Karen Shelton. He was preceded in death by his parents; his adopted parents; ten brothers, Frank, Harold, Marvin, Robert, Melvin, Donald and Eugene Shelton, Roy, John and Jack Gibbs and five sisters, Lorain and Alice Shelton, Mabel Brown, Vera Bast and Barbara Hay. Funeral services were Thursday, January 3, 2019 at 10:30 am at St. John Lutheran Church – Maxfield, rural Denver with Pastor Corey Smith officiating. Burial followed in the church cemetery with Military Rites conducted by the Denver American Legion, Post 653. Visitation was Wednesday from 4-7 pm at the Kaiser-Corson Funeral Home in Denver, Iowa and also an hour prior the service on Thursday at the church. There was also a gathering at the Denver American Legion with family and friends on Thursday, January 3 from 2:30-6 pm. Memorials may be directed to either St. John Lutheran Church - Maxfield, Cedar Valley Hospice or Denver Sunset Home and online condolences for Kenneth Pollock may be left at www.kaisercorson.com. Kaiser-Corson Funeral Home of Denver, Iowa assisted the Pollock family with arrangements.